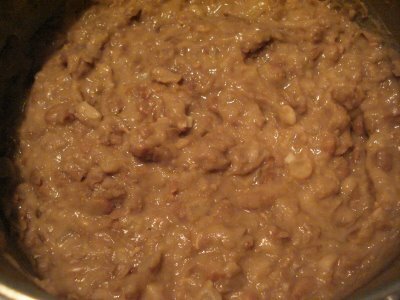 This recipe is the best I’ve ever had for refried beans. It is better than most restaurants! Best of all, it is completely fat free!!!! Place beans in heavy pot. Add about 6 cups of water & all of the seasoning. Bring to a boil. Cook, covered, for 3-5 hours, adding water as needed. The higher your elevation, the longer the beans take to cook. Mash beans with a potato masher or pulse in a food processor to desired consistency. If the beans are too loose/watery for your taste, cook over low heat until they are the thickness that you like.